Rep. Ilhan Omar of Minnesota, one of the first two Muslim women in Congress, accused President Trump on Saturday of inciting hatred of Islam and inspiring attacks like the killing of 50 people last weekend in a mass shooting at mosques in New Zealand. Omar’s speech at the Council on American-Islamic Relations dinner sparked a protest hours earlier of more than 100 people outside the hotel. Police closed a stretch of Canoga Avenue, and uniformed officers stood watch over demonstrators waving Israeli and U.S. flags and calling Omar an anti-Semite. 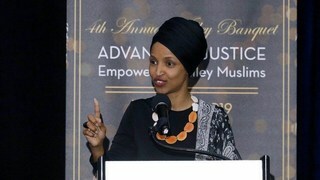 Recent comments by Omar that many criticized as anti-Semitic led the House to pass a resolution condemning hate speech. She’d said that pro-Israel advocates “push for allegiance to a foreign country,” and she’d apologized for suggesting money was the source of Israel’s influence in Washington.